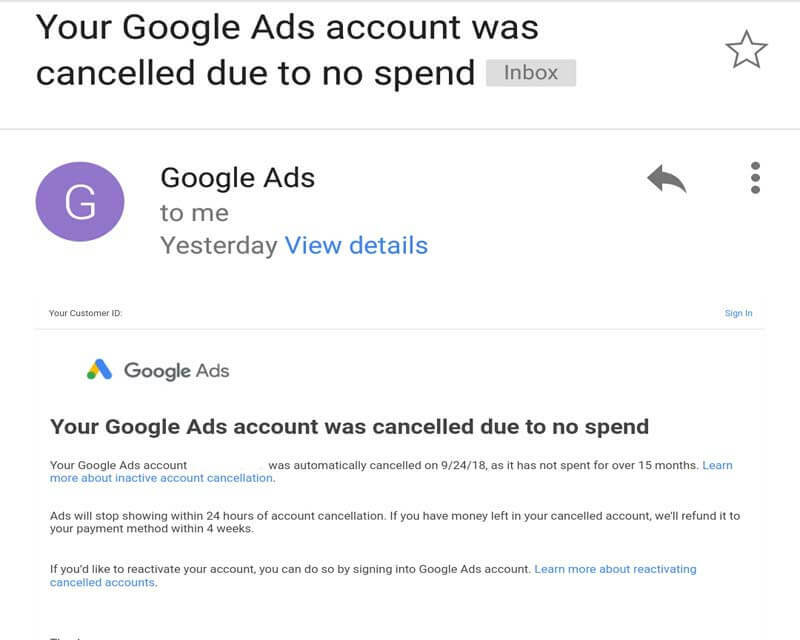 What is “Your Google Ads account was cancelled due to no spend” email? If you’re a Google Adsense publisher and received this kind email from your Gmail account, you don’t need to worry about it. The message is intended for those who previously created an ad campaign in Google Adwords which now Google Ads for the sake of Keyword Planner. If you did not fund your (test) campaign for the past 15 months, they will consider it as inactive and you will automatically receive notification from Google. First time reading the whole content of the email notice makes you panic why it happened to your account and the first thing that came into your mind is your Adsense account. Again, don’t worry as it is not related to your Adsense account. Ads will continue to run your websites and YouTube channels. If you read the email on your mobile phone, you will notice the new logo of Google Ads (see above image for reference) which now looks the same with AdSense. Again, this kind of email notification is for Google Ads or Adwords and NOT about your Adsense account. You can also read the help links provided on the email or visit Google Product Forums if you want to know more about why it happens.